Crow Hill Community Association | Serving residents and merchants in the Crow Hill area of Crown Heights, Brooklyn. Hope your week has been going well! I wanted to take a moment to let everyone know about our Craft Fair on Sunday, June 3. The fair will take place on the sidewalk of Franklin Avenue, between Sterling Place and St. John’s Placein Crown Heights, Brooklyn. The street will not be closed off. Anyone who would like to participate as a vendor should contact me ASAP as space is limited. Call me at718-230-1447. Vendor check-in is on the east corner of Sterling Place and Franklin Avenue. Set up time is 11-12pm. The event will officially start at 12:00pm, so set up must be completed by then. Vendors are responsible for their own tables (up to 6 ft), unless you have reserved a table in advance. All vendors are responsible for their own chairs, even if you are renting a table. Feel free to bring your own tablecloths (though, we do keep some on hand). You are responsible for own display items (risers, hangers, etc.). Because this is a sidewalk event, absolutely NO TENTS are allowed, however, umbrellas are welcome. We encourage you to bring signage to promote your business, however, all signage must be self supported. Vendor participation fee is $25 (w/o table rental) and $35 (with table rental). Fee will collected the day of the show (cash only, please). All participation fees directly benefit the Crow Hill Community Association. Please limit your ‘entourage’ – we welcome your friends and family to visit and shop, but let’s keep it moving so all can enjoy. Craft Fair ends at 6pm and all traces of our presence must be gone by 7pm. Looking forward to a great event! Please note: The order of agenda items are subject to change. Thanks to Susan Boyle and everyone else for spearheading yet another remarkable Children’s Halloween Parade. We will be posting more photos as we get them. If you live from Vanderbilt Avenue to Franklin Avenue between Eastern Parkway and Atlantic Avenue this meeting is specifically for you. Come out and have a sit down with your Neighborhood Coordination Officers Det. Lynch and PO Giglio. Applications for 15 affordable units are now being accepted for 317 St. Marks Avenue, which guarantees 50% of the units go to Community Board 8 residences. Click here to download the application and for more information, go to NYC Housing Connect. Public Comments on city agency responses to Community Board 8’s Preliminary Capital and Expense Budget for Fiscal Year 2018. (Testimony will be limited to 2 minutes per person. Please review the document in advance and have your comments prepared). Agency responses can be emailed to you or viewed at the District office in advance. Copies will be supplied at the meeting. Public Comments on city agency responses to Community Board 8’s Preliminary Capital and Expense Budget for Fiscal Year 2018. (Testimony will be limited to 2 minutes per person). If you were unable to make the first Citi Bike meeting last month, tomorrow will be your last opportunity to comment on locations for Citi Bike racks. Please come out and let your voice be heard. Community Board 8 Capital and Expense Budget requests for Fiscal Year 2018. Persons interested in viewing the budget items may do so at the District Office. Also, persons interested in speaking at the public hearing may register by calling the District Office at 718-467-5574. Testimony will be limited to three (3) minutes. Please be advised that the September CHCA General Meeting has been cancelled due to maintenance work being done at our hosting site, The Gospel Tabernacle Church. Our next meeting will be Tuesday, October 18th. The Crow Hill Community Association is excited to bring back Kids Day, an all day event, taking place on Franklin Ave between Sterling Place and Park Place, with games, rides, and other activities, ALL OF WHICH ARE FREE!!! If anyone is interested in helping out, either by providing items like tables and chairs, or by making yourself available on the day of to supervise or manage the grill, please let us know by emailingchca@crowhillcommunity.org. Saturday, 12:30pm – 7pm: Crown Heights Tenant Union March + Picnic! This Saturday: Brooklyn Museum’s WeAreCrownHeights Premier! Income-targeted rental opportunities available in Community Board 8, at 535 Carlton Avenue. Applications are available here and at affordable.535carlton.com. With the intention of celebrating our beloved neighborhood, select merchants on Franklin Avenue will come together to offer promotional deals this Sunday, July 17th. Whether you are a local resident or looking to explore parts of the City that are unfamiliar, we encourage you to come out and enjoy all that Franklin Avenue has to offer. See below for a detailed list of participating vendors and their respective promotions. BARBONCINO – 781 FRANKLIN AVE.
Free bottomless sodas with a pizza order. BKW – 747 FRANKLIN AVE. Happy hour from 4PM to 7PM. BOTTOMS UP – WINES & SPIRITS – 731 FRANKLIN AVE.
Wine tastings w/ different food pairing in our sunny garden. BUNSMITH – 789 FRANKLIN AVE.
$10 Korean Rice Bowls (Marinated Beef, Korean Fried Chicken, or Braised Pork – grab ‘n’ go / take out item. CENT’ANNI – 742 FRANKLIN AVE.
KELSO’S – 648 FRANKLIN AVE. Happy hour for our signature drinks 12 Noon – 10PM. ROSCO’S PIZZA – 685 FRANKLIN AVE.
Free CAN of soda or bottled water with every 2 slices of pizza. SUZETTE LAVELLE – WOMEN’S CLOTHING – ACCESSORIES & GIFT SHOP – 726 FRANKLIN AVE.
SUNDAY SIZZLER SALE – Everything outside $5 – $25. THE PULP & THE BEAN – 809 FRANKLIN AVE. VEGGIES NATURAL JUICE BAR – 785 FRANKLIN AVE.
Buy one drink get a patty half price. Buy two drinks get a free patty. VERIZON WIRELESS – 718 FRANKLIN AVE.
25% off accessories for everyone. 35% off for people with employee discounts (DOES NOT APPLY TO PREMIUM ACCESSORIES). WINO(T) – 796 Franklin Ave. HULLABALOO BOOK – 65 Franklin Ave.
10% off everything with a mention of the discount. LITTLE ZELDA – 728 Franklin Ave.
NAGLE’S BAGELS – 728 Franklin Ave. Affordable housing applications are now available for 461 Dean Street, for which there is information below. For a more comprehensive picture on the application process for affordable housing in NYC, you can check out Brownstoner’s Complete Guide to Applying for Affordable Housing in NYC. NEW YORK – Chancellor Carmen Fariña visited Bambi Day Care Center in Brooklyn today to announce the opening of 2016-17 Pre-K for All applications. All New York City families with children born in 2012 are eligible to apply starting today, and the first round of applications closes March 4. There are enough free, full-day, high-quality seats to meet the demand of every four-year old in New York City, and this year, a record 68,500 students enrolled in free, full-day, high quality pre-K. To make the enrollment process even easier, the Department of Education has moved up the application timeline. Families are now able to apply a month earlier than last year and will receive offer letters a month sooner. “Pre-K is critical year where students learn new vocabulary, experiment with science and make new friends. I’m proud that we have enough full-day seats for every four-year old in New York City. We are putting more students on the path to success than ever before. I urge all families with four-year olds to go online, call or visit a Family Welcome Center to apply,” said Schools Chancellor Carmen Fariña. All New York City families with children born in 2012 are eligible to apply to pre-K for the 2016-17 school year. This includes children with disabilities and children whose home language is not English.Families can complete the single application process online at nyc.gov/prek, over the phone at 718-935-2067, or in person at a Family Welcome Center. The single application allows families to list up to 12 full-day pre-K programs – including DOE district schools and DOE-run Pre-K Centers and NYC Early Education Centers (NYCEECs) – ranking programs of interest in order of preference. The online application is translated into all nine of the DOE’s languages, and families can submit an application over the phone or in person in over 200 languages. Families interested in half-day, 5-hour NYCEEC pre-K programs or charter school pre-K programs should contact those programs directly to apply. The DOE has also continued to identify a variety of language supports offered at certain programs. Twenty-seven pre-K programs have been designated as Dual Language (DL) and nearly 200 pre-K programs are designated as Enhanced Language Support (ELS). The earlier application process will give families more time to prepare for the transition to pre-K, and allow pre-K programs to pre-register students and make waitlist offers before the end of the school year. A second round of applications will begin the first week of May and will feature any newly awarded Fall 2016 pre-K programs; families will be able to explore new options and apply to more programs of interest. To explore their options, families can access a variety of resources. Families are encouraged to use the 2016 Pre-K for All Directory available on the pre-K website in ten languages. The Pre-K Directory contains detailed admissions information and updated program lists. Families are also encouraged to use the online Pre-K Finder for the latest information and program updates, with helpful mapping tools to help families plan their programs. Enrollment specialists will also be available to help families throughout the process to ensure they find a program that best fits their child’s needs. Applications to join your local Community Board are now available if you wish to serve. For those that do not know, Community boards are local representative bodies. There are 18 community boards in Brooklyn and each one consists of up to 50 non-salaried members appointed by the Borough President, half of whom are nominated by their district’s City Council members. Members of the community board must reside, work, or have some other significant interest in the community. Each community board employs a District Manager who establishes an office, hires staff, and implements procedures to improve the delivery of City services to the district. While the main responsibility of the board office is to receive complaints from community residents, they also maintain other duties, such as processing permits for block parties and street fairs. Many boards choose to provide additional services and manage special projects that cater to specific community needs, including organizing tenants associations, coordinating neighborhood cleanup programs, and more. Please join us from 3pm to 5pm on Sunday, January 31st as we partner with The Free Portrait Project: Crown Heights and the Five Boro Story Project for an Ice Cream (and hot soup!) Social, and story circles led by Five Boro Story Project’s Bridget Bartolini, with #wearecrownheights portraits on display, and live music by Amos Rose and Everything Forever. The first 25 scoops of ice cream are on the house, courtesy of the Crow Hill Community Association, so come early! This event is free to attend and open to the public. Drinks and Kosher Fare will be available by donation. I am proud and excited to launch Participatory Budgeting in the 35th Council District. This process will be an incredible opportunity for the community to come together to discuss how they would like to spend $1 million dollars within the community. The success of this endeavor can only happen with your assistance. I want to make sure that the diversity of the District is incorporated every step of the way and I certainly need your support. One of my goals for Participatory Budgeting is to identify new leaders and or the next generation of leaders. Your leadership throughout Brooklyn is undeniable and I would be so honored if you would participate in this process and also bring a new leader to the table to serve as a Delegate to the Participatory Budgeting Process to represent different neighborhoods, segments of the community (i.e., schools, art and culture, transportation, etc.) and the many voices of the neighborhood. Please let me know the name of the person that you would like to become a part of this process and a short paragraph about their professional affiliations and relevant work within the community. The first meeting will be held on Wednesday, September 9 at Medgar Evers College, Nadeen Lawe Activity Center, 1650 Bedford Avenue 2nd floor, Room B2024 Brooklyn, NY 11225 from 6:30PM – 9:30PM. All of the relevant information pertaining to the responsibilities of a delegate as well as the upcoming meetings is attached for your reference. It is important to note that all delegates would be required at all three meetings and or workshops. I look forward to your response by the close of business on Thursday, September 4. Should you have any questions or concerns, please contact my Legislative and Budget Director, Drew Gabriel at (212) 788-7081 or district35pb@gmail.com. 6. Ms. Elana Bulman, Program Manager from Solar One will give a brief presentation on Here Comes Solar. 7. Presentation by the Dept. of Transportation on the proposed changes to Utica Avenue between Bergen Street and Atlantic Avenue due to B46 Select Bus Service. The Mayor’s Community Affairs Unit (CAU) is the direct link between the Mayor and New York’s communities. CAU organizes participation in key mayoral initiatives at the community level through direct contact with community boards, organizations, and city residents. CAU plays an active role in public events across the five boroughs and in connecting to New York’s diverse communities. Interns will gain experience in government and community organizing while working side by side with senior office staff to carry out the Mayor’s key initiatives across New York City. Internships with CAU will provide an opportunity to assist with and attend many government and community events and get an inside look at New York City government. Ideal candidates will be highly reliable and motivated, independent, sociable, and comfortable in high pressure situations. This is a perfect opportunity for students focusing on areas such as public affairs, public policy, and political science. Multiple internships are available. Based on skills and interests, internships may be designated to focus on key constituency or program areas. Full time and part time internships are available (min 15 hours/wk). All internships are unpaid; will complete paperwork necessary for student to receive available college credit. Assisting Borough Directors and Deputy Commissioners with community engagement and organizing, including meetings, presentations, public activities. Identifying and cultivating relationships and opportunities around major issues, in neighborhoods, or with key constituencies. Planning, preparing for, and attending meetings and events, logistics coordination, and event promotion. Assisting with the development of social media outreach and communications. Help build and maintain constituent tracking systems, databases. Assist with correspondence and constituent case management. Proficiency in a language other than English highly desirable. Please send resume and cover letter to TLin@cityhall.nyc.gov. 6. Mr. Jim Mutton, Director of NYC Operations at Concern for Independent Living will give an update on the construction of 1522 Bergen Street. 7. Mr. Richard Farrell, Chief Assistant District Attorney from the Kings County District Attorney’s Office Real Estate Fraud Unit will make a presentation on Real Estate Scams. 8. Ms. Kristia Beaubrun, Communications Director at Councilwoman Laurie Cumbo’s office will give an update on their new online resource service. 9. Ms. Elana Bulman, Program Manager from Solar One will give a brief presentation on Here Comes Solar. Please be advised that there will be a meeting on Tuesday, June 9, 2015 at the Center for Nursing and Rehabilitation, 727 Classon Avenue (bet. Park & Prospect Places), Brooklyn, N.Y. at 6:00 p.m to discuss the design for Stroud Playground. The Center for Community Leadership’s borough-based Fellowship programs connect mid to senior level professionals with fellow leaders and experts in the non-profit world. During these 9-month professional development training programs, Fellows will have the opportunity to hone their networking, community-building and leadership skills, as well as build relationships with other organizations and professionals in their borough. ELH Mgmt. LLC, the managing agent for NIA JV Project is pleased to announce the marketing of the newly rehabbed projects in Crown Heights and Bedford Stuyvesant. 14 rehabilitated units are available at 177 Rogers Avenue and 96 Brooklyn Avenue in Crown Heights and 295A Bainbridge Street and 233 Ralph Avenue in Bed Stuy. The deadline to apply is May 13, 2015. Completed applications must be returned by regular mail only (no priority, certified, registered, express, oversized or overnight mail will be accepted). Applications will be selected by lottery; applicants who submit more than one application will be disqualified. 6. Election for Executive Officers for the term of June 2015 thru May 2017. Please note that the By-Laws also state, “The appointed member [under review for removal] shall have the right to respond to the charges and specifications, the right to counsel and the right to produce witnesses or evidence on his or her behalf.” If you would like to come to the defense of Mr. Henderson, you may do so. 5. Dept. of Transportation and NYC Transit will give an update on the Utica Avenue Select Bus Service (SBS). The link below leads to a petition asking NYS to allocate capital funding for hospitals in Central Brooklyn. Please share. What’s your big idea for the future of New York City, friend? Every four years, New York City updates PlaNYC to make sure that we’re building toward a future that’s resilient, sustainable, and makes sense for the lives of all New Yorkers. This year, we’re making equity a lynchpin of PlaNYC — and we’ve made the process more inclusive than ever before. Every New Yorker has a voice in this plan and can participate in building our city’s future. What’s your vision for New York City in the years and decades to come? Take this survey now to let us know. Your idea could be about anything: from the environment to jobs to education to affordable housing to transportation. You have the power to shape the future of our city if you speak up — for yourself and for future generations of New Yorkers. In commemoration of the 50th anniversary of the first of three marches conducted by civil rights activists in 1965 from Selma, Alabama, to the state’s capital of Montgomery – marches that helped lead to the landmark Voting Rights Act of 1965, Brooklyn Borough President Eric L. Adams invites you to march in partnership with him this Saturday, March 7, over the Brooklyn Bridge, symbolizing the famous crossing of the Edmund Pettis Bridge. The theme of the march is “Selma is Everywhere,” memorializing our shared commitment to civil rights, racial equality and progressive reform. We are planning to gather at 10:30 AM on the Manhattan side of the Brooklyn Bridge, followed by a kickoff press availability at 11:00 AM and the step-off at approximately 11:30 AM. We will be marching to Brooklyn Borough Hall, where we will gather to watch President Barack Obama’s address to the nation from Selma. If you would like to be part of this important event, we ask that your organization make a commitment to bring at least ten marchers with you, so we can build this unity message in partnership. Please e-mail Stefan Ringel, Communications Director for Borough President Adams, at sringel@brooklynbp.nyc.gov as soon as possible if you wish to be part of the promotion of this event, including mention on a flyer, as well as to let us know how many marchers you will be bringing. 6. Presentation on the renovation of 77th Precinct Annex Office—Stable Building, 563 Grand Avenue. The two-story stable building is attached to the Annex that was not renovated in 1997 along with the main building. The renovated building will be used for additional office space. Public Comments on city agency responses to Community Board 8’s Preliminary Capital and Expense Budget for Community Board 8’s Preliminary Capital and Expense Budget Fiscal Year 2016. (Testimony will be limited to 2 minutes per person). Discussing issues of race and racism with children can feel challenging for many adults in caregiving roles, especially when speaking with the very young. It is a challenge that can be met if we embrace the importance of preparing the next generation to live in and foster an equitable multiracial society, and connect with others to share perspectives, resources and tools. Please join us for an evening of honest and open dialogue centered on this critical aspect of community life. Rachel Ehrlich is an anti-bias educator. She attended Hampshire College and received a B.A. in Urban Studies from New College of California. She has an M.S.W. in Clinical Social Work from Smith College and a M.A. in Social Justice Education from UMass Amherst. She is working toward a PhD in Urban Education at the CUNY Grad Center. Her dissertation focuses on educational policy, teacher’s unions, and racial and class inequity. She regularly consults with public and private school teachers/administrators on social justice education, diversity, and inclusion. At the Fieldston Ethical Culture School she is the chair of the Ethics Department 6-12th grades, a College Counselor, and teaches courses focused on power and social justice. She lives in Brooklyn with her wife Jill, son August, and bulldog Gilda. John Gentile is originally from Washington D.C. and attended Georgetown Day High School. He is a graduate with honors from Eugene Lang College at The New School in New York City. He is a nationally recognized diversity and inclusion consultant focusing on whiteness, white identity development, and white privilege. He has worked with many prestigious educational institutions and organizations including The Trinity School, Ethical Culture Fieldston School, Riverdale Country School, The Town School and The New School in New York City as well as the Oakwood School in Los Angeles, California, Hathaway Brown School in Shaker Heights, Ohio and Worcester Academy in Worcester, Massachusetts. He has lead workshops, facilitated dialogues and affinity groups, trained faculty, and has been featured as a keynote speaker. He has also presented at the Critical Analysis of Race in Learning and Education (CARLE) Institute and the Immigrant Justice Corps in New York City. He has been a faculty member for the National Association of Independent Schools’ Student Diversity Leadership Conference since 2009. He is a founding faculty member of the National Diversity Directors Institute at St. Andrew’s Episcopal School in Potomac, Maryland. He was the recipient of The Princeton Prize for Race Relations in 2007. Martha Haakmat has taught and led in New York City independent schools for the past 27 years. Currently the Head of School at the Brooklyn Heights Montessori School, Martha has been a lower, middle and upper school educator and has held administrative positions such as Diversity Director and Middle School Head. Martha has served as an independent school trustee and has been a member of various committees for the National Association of Independent Schools (NAIS). She was also the founder and director of Educators for Growth and Empowerment (EDGE), a diversity consulting team that presented in schools and conferences nationwide. Martha has three daughters who are being educated in the independent school system. Delia Hernandez worked as a teacher and administrator in NYC independent schools for twenty years before moving on to her current role as Lecturer in the Education Program at Kjngsborough Community College. She is working toward a PhD in Educational Psychology at the CUNY Graduate Center where she is exploring the impact of race, ethnicity and class on the development of teacher identity. Delia is a Park Slope native with two sons, ages 7 and 10, and a sweet puppy named Coco. Due to freezing temperatures and a very inclement weather tonight’s Crow Hill Community Assoc. meeting is cancelled. Ms. Celeste Farmer from the National Alliance on Mental Illness (NAMI) will make a presentation on Mental Health Awareness. With 421a and Rent Laws set to expire in June 2015, the City and the State are at critical moment. Will we put the public benefit of affordable housing before the private profit interests of real estate developers? Our government officials have the opportunity to send a clear message about our priorities by strengthening the rent laws and reforming 421a so that they serve and protect our communities’ local affordable housing needs. Today, ANHD released our 421a Policy Reform Proposal, posted online HERE. 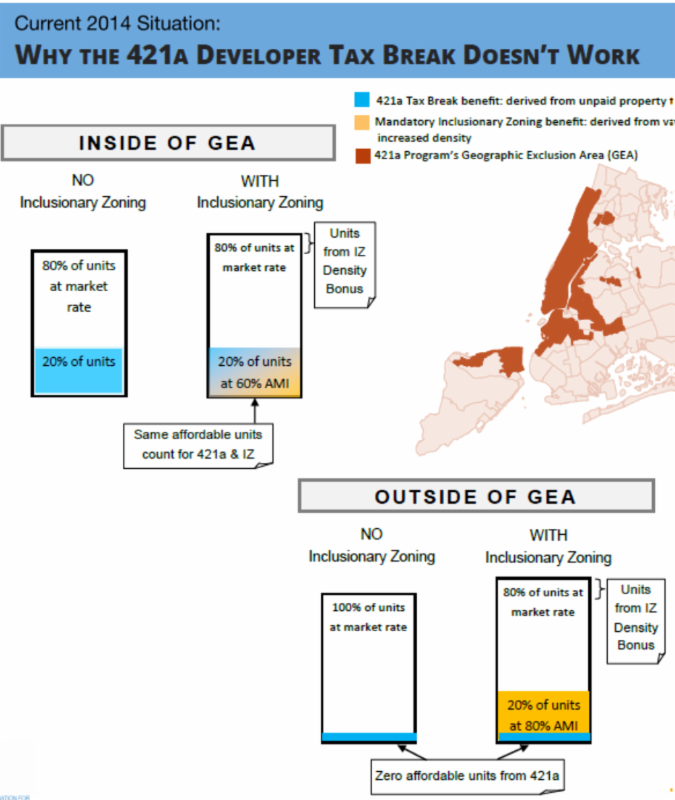 In this report, ANHD outlines the how the 421a Developer’s Tax Break could be completely revamped in order to become a true affordable housing tool that meets the needs of local neighborhoods instead of a billion dollar boondoggle for real estate developers. Require that 421a developments make at least 25% of apartments affordable available at 30% AMI level, to serve the 1/3 of New Yorkers struggling the most with housing costs. Require on-site affordable apartments in every neighborhood. Make all affordable apartments permanently affordable. Prohibit double-dipping when 421a is used in conjunction with other affordable housing subsidies. Promote mixed-income communities by ensuring the fair and equal treatment of all tenants. Ensure that 421a rules are transparent and adhered to by creating a compliance fee to fund the enforcement of tenants’ rights and program rules. It’s long past time to re-evaluate the 421a Developer’s Tax Break. The City and the State cannot allow such a flawed and outdated program to continue. Either we Fix the 421a Developers’ Tax Break, remaking it into a true affordable housing program that meets the affordable housing needs of local New Yorkers… or we End it. The current 421a program’s paradigm cannot continue. We cannot afford to subsidize luxury real estate that is unaffordable to average New Yorkers. Download the full 421a Tax Break: Fix it or End it. 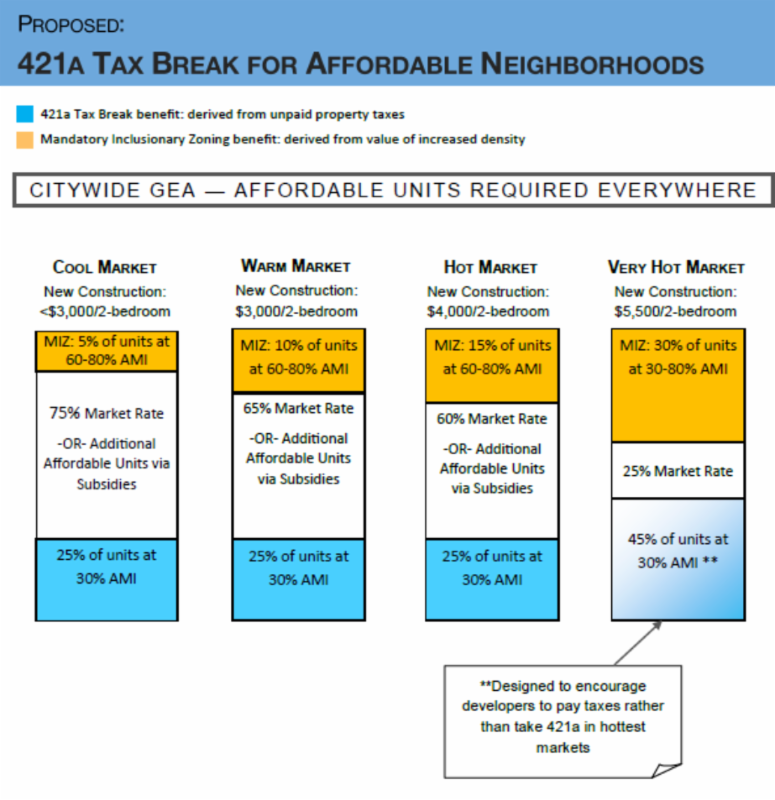 Read more on 421a in ANHD’s 421a Developer’s Tax Break Analysis. For those interested in renewing their Community Board membership or becoming a member, please find attached the community board new member and reappointment applications for 2015. Please note that the deadline to submit completed applications has been extended to February 15, 2015. The applications can also be downloaded from www.brooklyn-usa.org. It is also suggested that you print hard copies of the applications for distribution at your CB office. Please note that community board membership is now open to individuals starting at age 16. Let Your Voice Be Heard On Community Policing, Criminal Justice Reform, Reducing Stereotypes, Improving Outreach and Public Safety! Hundreds of thousands of New Yorkers are missing out on anywhere from $2,000 to $10,000 in tax credits, like the Earned Income Tax Credit and Child Care Tax Credit. About 25% of eligible working families fail to claim their money – money families need to help pay for daily necessities – because many people don’t know about these programs. Our fellow New Yorkers need information on how to get these credits and how to get free tax preparation and financial counseling to make the most of their refund – and YOU can help make it happen. Please forward this message widely to your community and share online here! ON SATURDAY, JANUARY 31 THE NYC DEPARTMENT OF CONSUMER AFFAIRS IS HOSTING THE FIRST EVER PHONE-A-THON TO LET OUR FRIENDS AND NEIGHBORS KNOW ABOUT REFUNDABLE TAX CREDITS. YOUR TWO HOURS WILL HELP A FAMILY MAKE ENDS MEET. A location in every borough! Click here for locations. Spread the word about January 31 on Twitter or Facebook and use #GotMyRefund! Follow the Department of Consumer Affairs (DCA) on Twitter (@NYCDCA), Like us on Facebook, and share important information, ask questions, or let us know how DCA is working for you. Be sure to tag us @NYCDCA. Thank you in advance for your support, and we hope to see you on January 31st! Khew and Cornelius explore, both as architects and artists, the cities of Ms. Khew’s Southeast Asian upbringing. In DepthForms they take these cities in addition to New York as the subject matter for an investigation of the contrasting phenomena of depth and flatness, using 2-dimensional, 3-dimensional, and 2.5-dimensional methods of representation to question our conception of urban space. The two artists now live in Singapore. Directions: Take 2, 3, or 4 trains to Franklin Avenue. Walk two blocks against the traffic on Franklin. Walk ¾ block to 558 St. Johns Place. FiveMyles is within easy walking distance from the Brooklyn Museum. NYCDOT will be presenting a refined safety proposal for the intersection of Atlantic/Washington/Underhill Avenues at a jointTransportation Committee meeting with Community Boards 2 and 8 on Tuesday, December 16th. DOT previously proposed improvements to the intersection in 2011, but implementation was delayed due to water main construction at the location. A representative from DOT said that the agency’s intention now is to complete construction of the Washington Avenue improvements in the spring of 2015. Registration Period: 5 to 9 p.m.
Plan your trip with which provides you with travel directions that take into account any planned service changes. Comments can be submitted via email through our website at www.mta.info or by letter to MTA Government Affairs, 347 Madison Ave, 5th floor, New York, NY 10017. Customers may also visit the satellite facilities on the dates and times listed where comments will be videotaped. All comments will be transcribed and made part of the permanent record of these hearings. Thanks to all those who helped the Crow Hill Community Association put together the Thanksgiving Food Basket Giveaway last week. With your support, we were able to provide Thanksgiving dinners to needy families in the community. It was a raving success and we hope to have many more events like this in the future. 4. Ms. Sharon McLeod from the New York Memory Center will report on the statistics of Alzheimer’s disease and the impact in Brooklyn. 5. Ms. Nicole Francois, Assistant Vice President, Strategic Development & External Affairs at Interfaith Medical Center will make a presentation. On Thursday, October 9th 2014, 20-30 unsupervised students from local schools began a terrifying brawl outside a quiet Coffee shop on Vanderbilt Avenue b/t DeKalb and Lafayette Avenues (after school hours). Local business owners tried, desperately, to intervene but were met with profane language from students. 911 was called. 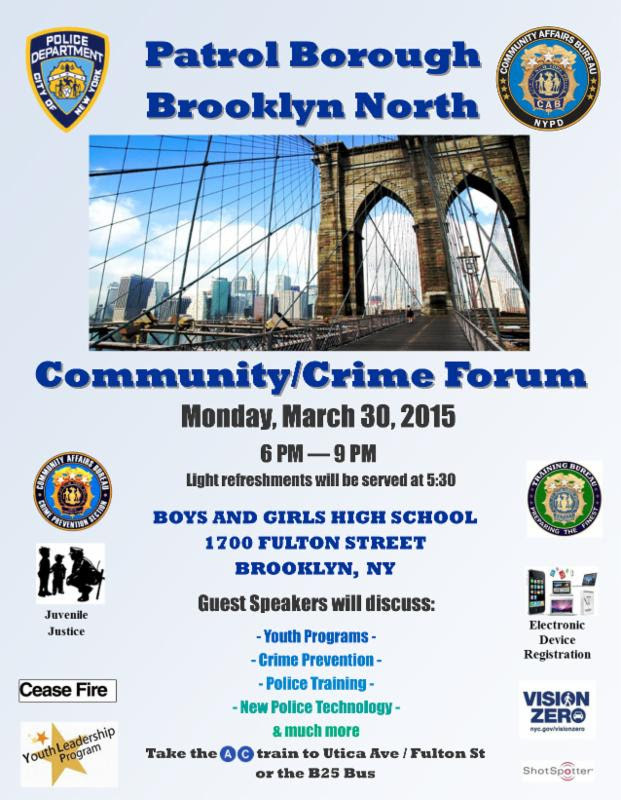 Come and join the conversation and help us to keep our neighborhood safe. Ms. Jeneen Johnson from NYC HRA Child Support will make a presentation on child support enforcement information. Ms. Cara Lacey from Liro Group and Mr. Shane Ojor from the NYC Dept. of Environmental Protection will make a presentation on Bioswales, Storm Water Greenstreets, and other storm water management measures. The Mobile Legal Help Center is a partnership between the New York Legal Assistance Group (NYLAG) and the New York State Courts’ Access to Justice Program that provides free civil legal services to New Yorkers in need. Private meeting rooms and technology inside the vehicle enable it to function as a full-service office. To Make an Appointment please visit the office of Council Member Laurie Cumbo on November 21, 2014 from 10am to 3pm. We can make the C train faster and more reliable! Brainstorm with your neighbors and fellow riders for faster and more reliable C train service! There will be dinner served, so sign up on their website or reply to this email to let them know you’ll be attending. Community Board 8 is hosting a public hearing seeking public comments on the proposal to reduce street cleaning days throughout the district. Currently, the Dept. of Sanitation cleans the street 4 times a week and the reduction will scale the cleaning to twice a week. Please come out and let your voice be heard. If you are unable to attend the public hearing, please email your comments to brooklyncb8@gmail.com. Please indicate the neighborhood that you live in and whether you are for or against the proposed change. Please put ASP in the subject line. Click here for more information or contact Community Board 8 at 718-467-5574. The Crow Hill Community Association is happy to announce our annual Franklin Avenue Halloween Parade. Where: Starting and ending at the Walt Shamel Dean North Community Garden, located at 1096 Dean St.
For more information, check out this flyer and please tell everyone you know! Settlement Housing Fund DREAMS Youth Build will make a presentation regarding their program for young adults ages 17-24. NYCEDC and local elected officials are hosting two meetings to further discuss this redevelopment project with the larger community. Each community forum will include a brief presentation on the project followed by small group discussions. Please also help us spread the word about these meetings, and encourage everyone to RSVP using the link above. Having an accurate expected head count will allow us to adequately accommodate the community at each meeting. *Our Preschool Gan will be open during Tot Shul times. Children under 3 yrs. must be supervised by a parent or adult. All services & meals will take place at the Chabad Heights loft space. Located at 664 Sterling Place 2nd floor with our awesome children’s program held on the 1st floor at our recently launched Brownstone Gan Katan Preschool space. For more information on Chabad Heights, click here. CHCA Craft Fair This Sunday! “Shop The Block” is back this Sunday after a remarkable turnout last month! Come one! Come all! Meet local artisans from the neighborhood, some of who were present at the last Craft Fair, but others who were not. On September 27, join fellow community members to support a safer, more vibrant Atlantic Avenue for everyone. We’ll have our kickoff at the Brooklyn Christian Center, where we’ll present ways to build a safer street and gather public feedback that will be delivered to NYC’s Transportation and City Planning departments. Then we’ll walk along Atlantic as a group, through Bedford-Stuyvesant, Clinton Hill, and Crown Heights, taking stock of problem areas and a recently redesigned intersection, as well as key organizations, businesses, and block associations working to make their communities stronger. Crow Hill Community Association will be conducting a clothing drive for Georgia’s Place, located at Prospect Place & Bedford Ave.
Community Counseling and Mediation (CCM) is a neighborhood–based agency providing a wide range of social welfare, health, education, vocational, and supportive housing services to at-risk children, youth and families in New York city. Georgia’s Place is an innovative supportive housing residence for 48 formerly homeless and low income adults. Georgia’s Place staff are committed to the health of their residents in a holistic way: mental, physical, emotional. Where: In front of the former site of the CHCA Community Garden (730 Franklin Ave) between Sterling Place and Park Place. Alternatively, drop offs can take place on Tuesdays from 5pm – 7pm at Georgia’s Place during Farmshare pick-up. Donations: New/Slightly used men’s and women’s clothing. For more information, contact Mr. Frank at 718-230-1447. Be sure to access this flyer for dates, times and location. Community Board 8 is seeking residents to serve on one of 11 committees. Please review the following information. Hopefully, you will feel enlightened enough to join a committee and participate on Community Board 8! Attached is the flier for the upcoming screening of My Brooklyn that will be followed by a discussion with the film’s director Kelly Anderson and leaders of the CHTU. We’ll talk about the film, gentrification, and tactics to fight gentrification. Please feel free to share this. Post it in your building, on your block, and around the neighborhood. We’re hoping to not only watch a great film, learn, and talk, but to also come together and continue to build a stronger community. Details are below. We hope to see many of you there! For more information on the documentary, you can visit the official website by clicking here. From now until Saturday, August 30th donate at least 1 new book bag and new school supplies to give away to children from pre-school to high school. For questions contact Jocelyn Mann. Registration for the ‘Brooklyn Pitbulls Youth Football’ program in progress since April 2014. Are you interested in playing football? If you are Age 8-15, it is not too late, but time is running out! We are a 501 (c) 3 organization that has been servicing the Fort Greene and Clinton Hill area for the last 10 years. We are reaching out for the support of the community. If you are interested in supporting our program, we are trying to raise $10,000. We are asking for 250 people to donate $40. Each donation will be mentioned on our website, unless instructed otherwise. All donations are tax deductible. In advance, we thank you for your support. When: Saturday, August 16, 2014, from 11:00am – 6:00pm. Book of 6 chances $50. Sellers prize; The person who sells the winning ticket for the car, get $1,000. Prizes are being sought through donations, which are needed. Proceeds from the event is to help with the installation of either a Ramp, or an Elevator to assist the elderly and handicapped who attend Mass. On Tuesday, August 5th, the 77th Precinct Community Council along with the 77th Precinct and Deputy Inspector Eddie Lott Commanding Officer will host the 31st Annual “America’s National Night Out Against Crime” Event. For the past 31 years this National event has brought thousands together in support of the fight for a safer community. This is the third year that Save Latin America Inc. will join them in bringing additional health services to our community and working together to strengthen neighborhood spirit. National Night Out’s purpose is to heighten crime and drug prevention awareness and to send a message to criminals letting them know our neighborhoods are organized and fighting back. This year‘s Health Fair will continue to include Mammogram and Dental screenings and Free Children Identification cards from 11AM – 4PM along with their yearly entertainment in place for children throughout the day. They look forward to your attendance for a day of family fun, food and most of all health awareness. We want to let you know that on Sunday, August 3, we will sponsor a “Shop The Block” Craft Fair on Franklin Ave., between Sterling Place and St. John’s Place. The street WILL NOT be closed to traffic. The vendors will have their tables placed on the sidewalk in front of your residence. All of the vendors will either live in our community, or live in Brooklyn. The Crow Hill Community Craft Fair’s mission is to build community by supporting Brooklyn based artisans as they promote their craftworks, while giving friends, neighbors, and other folks an opportunity to socialize and support the local economy. Participation fees raised from the craft fair directly benefit the Crow Hill Community Association. If you are a craftsman, or artisan, and would like to participate, please download an application below and email it to us at CHCCRAFTFAIR@ GMAIL.COM. We are also in need of some 6 feet long folding tables. If you have any to provide or have any questions concerning this event please, feel free to contact CHCA President Frank Esquilin at 718-230-1447. The Friends of South Oxford Park present a Jazzmobile Concert in South Oxford Park on Monday, July 26, 2014. Come relax on the lawn while enjoying an evening of American Classical music known as JAZZ. For more information, call (718)778-1200. Come out and get FREE information about preparing for the rest of your LIFE! 1. Pacific Street, between Sixth and Carlton Avenues, will be converted from two-way to one-way westbound. Vehicles will be able to access this block from both northbound and southbound Carlton Avenue. 2. The north sidewalk on Pacific Street, near Sixth Avenue only, will be closed to pedestrian traffic. 3. Parking and loading along the north side of Atlantic Avenue, between Ft. Greene Place and Cumberland Street, will be prohibited. Parking along the north side of Pacific Street, near Sixth Avenue only, will be prohibited. 4. The westbound B45 bus stop on the north side of Atlantic Avenue, at S. Portland Avenue, will be temporarily removed. Passengers can use the previous stop on Atlantic Avenue, at Carlton Avenue. The Pacific Street direction changes will be in effect for approximately 4 months. The Pacific Street sidewalk closure and parking prohibition will be in effect for approximately 12 months. The Atlantic Avenue parking prohibition and bus stop removal will be in effect for approximately 24 months. MPT installation and roadway striping on Atlantic Avenue will occur overnight and should take two nights to complete. Following that, work to remove the concrete median on Atlantic Avenue will be during daytime hours. Please see attached flyer for map and more information. Kids 18 years and under can receive FREE summer meals from now through August 29th. Find out more by calling 311, texting NYCMeals to 877-877 or visiting www.schoolfoodnyc.org. Imagine a Preschool where children don’t want to miss a day. They come in with a smile and leave humming a musical tune. Walking through the rooms, you can hear the sounds of lively learning, song and laughter. Imagine a child who grows up with the warmth and spirit of Judaism, carrying the pride of their Jewish identity into their adult lives. Introducing the Brownstone Gan Katan, an engaging, hands on new preschool. Founded on the belief that successful education is a result of exploration and creativity, the Gan invites the children to actively engage with their Jewish heritage through discussion, crafts, song and drama. Our warm and dynamic staff emphasize personal attention and care, ensuring the individualized success of each student.At the Gan we understand that we are only as good as our teachers are. With that in mind, we cultivated a team of enthusiastic educators professionally trained to engage the children’s natural curiosity and thirst for knowledge. Amongst our warm and caring staff, students feel safe to explore, learn and grow. To schedule a private tour, please contact me at Chaya@gankatan.com or 347.787.6578 We look forward to seeing you and your precious little ones. Thank you to all the parents who already stopped by for a visit and enrolled, it was a pleasure meeting you all. Berg’n Beer Hall, located at 899 Bergen Street (between Franklin and Classon) is on the verge of opening its doors. With that, they are hosting a job fair on Tuesday, July 1st from 11am – 1pm and 5pm – 7pm. Applicants can either bring in a resume and cover letter or fill out this application (which they ask be filled out before you arrive). SNAP, or the Supplemental Nutrition Assistance Program, is the new name for the Food Stamp Program. Just like Social Security, SNAP is a federal program that provides a monthly benefit that can help with grocery costs, freeing up precious income for other household and medical needs. This Tuesday, June 24th, representatives for the SNAP Program will be making a visit to the Fort Green Albany Senior Center (196 Albany Avenue) on Tuesday, June 24th from 1pm to 5pm. For more information on their organization and the SNAP Outreach Program, click here. For information on their on-site visit at the, click here. CB8 Transportation Committee Meeting Tonight! The Transportation Committee of Community Board 8 will be meeting on Tuesday, June 24, 2014 at CNR-Centerlight Health Care Center (in the Atrium) located at 727 Classon Avenue corner Park Place, Brooklyn, N.Y. at 7:00 p.m. The Dept. of Transportation is considering the following locations to install Bike Corrals. The Bike Corral program includes clusters of bicycle racks installed in the street by the curb, surrounded by two large planters, taking over one parking space. Each bike corral can hold up to 8 bikes. Bike Corrals require a partner who agrees to keep the corral clean of debris and snow. The Dept. of City Planning’s Transportation Unit would like to kick-off a discussion regarding a transportation study for Pedestrian Improvements along Atlantic Avenue from Ralph Avenue to Vanderbilt Avenue. Come out and add your input on safety and travel issues you experience while traveling, biking, walking, etc., along Atlantic Avenue. Please be reminded that the M1-1 sub committee will meet tonight at 6:30 PM at CNR located at 727 Classon Avenue (between Park and Prospect Places). Please note that representatives from the Dept. of City Planning, BP Adams’ office, and Councilwoman Cumbo’s office will be in attendance to discuss the committee’s findings for the manufacturing zone. Click here for an enrollment form. The Community Board 8 Public Safety Committee is hosting an emergency town hall meeting to address the rise in Gun Violence within the 77th Precinct. Come out and let your voice be heard!!! Friday, June 13, 2014 at 6:00 p.m.
Dr. Roy A. Hastick, Sr., President/CEO, Caribbean American Chamber of Commerce and Industry, Inc.
To RSVP or for more information, contact Danielle Jones at djones@osc.state.ny.us or call 212-383-4584.
providing fascinating details on points of particular interest. Clinton Hill includes an amazing diversity of nineteenth century architecture, ranging from mansions designed by some of the best architects of the period for wealthy families to more modest frame dwellings, fine apartment houses, churches, and impressive institutional buildings. Ms. Jill Maxwell, Esq., NYC Department of Consumer Affairs will provide an overview of the City’s new Paid Sick Leave Law. New York City Council Member Laurie A. Cumbo, Chair of the Women’s Issues Committee, with artist Tatyana Fazlalizadeh and Hollaback! Join us for GIRL POWER, a hands-on art workshop experience celebrating sisterhood. The organization, Hollaback will bring teens together in a safe and fun setting to discuss street harassment and other challenges confronting young women in NYC. We will find our assertive voice, create powerful sayings, and participate in an art-making workshop led by artist Tatyana Fazlalizadeh; who will take us on a street art wheat-pasting adventure! Young women between the ages of 12-17 years of age are encouraged to participate. The Parks Committee of Community Board No. 8 cordially invites you to attend its Annual Community Awareness Day on Saturday, June 7, 2014 from 11 AM to 3 PM in front of the St. John’s Recreation Center located at 1251 Prospect Place (between Troy and Schenectady Avenues). Organizations in the community will be on hand to distribute information on their services. It is an opportunity for you to learn what programs exist in the community and how they can be of assistance to you. Borough President Eric Adams invites you to a Safety Awareness workshop on Thursday, June 5, 2014 from 5:30-8:00 p.m. at Borough Hall. Mutual Housing Association of New York Management, Inc. will be hosting a Housing Lottery Seminar to educate residents of Brooklyn about the City’s affordable housing lottery process and maximizing the opportunity to be selected for City-sponsored affordable housing lotteries. 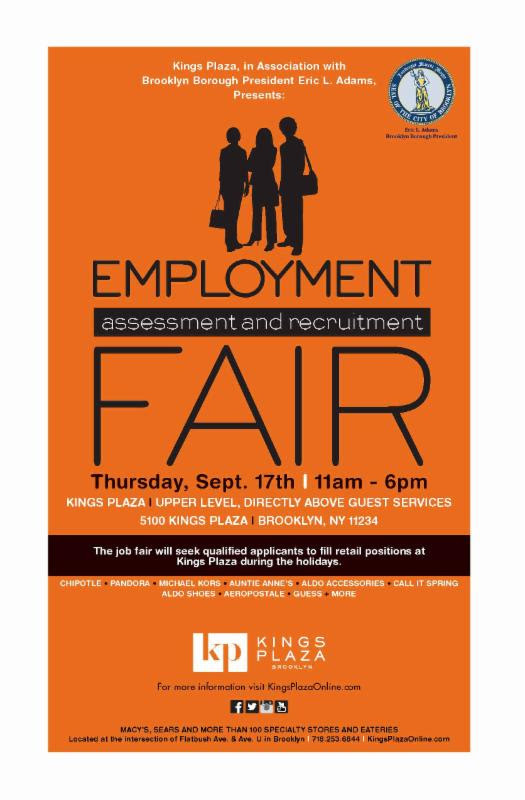 Feel free to contact Petra-Ann Younge at 718-246-8080 ext. 207 or petra@mutualhousingny.org with questions or comments. Bring a bike, a child and a helmet for this fun free event! Show your child aged 5 years or older how to ride a two-wheeler using the “balance first” method. Pre-registration is required. When: Saturday, May 31 from 10:00 a.m.-1:00 p.m.
Light refreshments will be served at each workshop. In September, world leaders are coming to New York City for an historic summit on climate change. With our future on the line and the whole world watching, we’ll take a stand to bend the course of history. Together, we will take to the streets in a People’s Climate March to demand a world with an economy that works for people and the planet. A world with jobs, clean air, and healthy communities for all. A world safe from the ravages of climate change. Let’s Move, Fort Greene: BIKE WITH US! Learn how to ride a bike or improve your biking skills. Bikes will be provided. All events are FREE! 1185 Carroll St. @ Nostrand Ave.
Click below for the DANCE AFRICA 2014 schedule of events. The Brooklyn Community Church in Fort Greene will be collecting new and gently-used clothing for adult male and female residents of the Auburn Shelter, which is also in Fort Greene. For more information call (718)622-4500.
a free breakfast and tour of Brooklyn Tech High School from 10 a.m. to 12 p.m.
For more information, you may contact the office of State Senator Velmanette Montgomery at (718)643-6140.
consolidating resources for the 2014 summer apprentice program. The program runs from Tuesday, July 8th – Friday August 22nd. If you know of a teenager who may be interested in the program, email jstokes@myrtleavenue.org for more info. Testing & information on transmission and treatment. Please be advised that the SLA & Sidewalk Café Review Committee will meet on Monday, June 2, 2014 at 6:00 PM at CNR-Center Light Health Care Center, which is located at 727 Classon Avenue, Brooklyn, NY (between Park and Prospect Places). Your prompt attendance is anticipated and expected. Please be advised that there will be a meeting of the Transportation Committee on Tuesday, May 27, 2014 at CNR-Center Light Healthcare Center located at 727 Classon Avenue (Board Room) at 7:00 p.m. Representatives from Transportation Alternatives are requesting CB8’s support of a feasibility study to bring pedestrian, bicycle and public transit improvements to Atlantic Avenue from Ralph Avenue to Vanderbilt Avenue. Attached find flyers for information sessions being offered March 20-22 in each borough to inform families about how to find and apply for pre-K in Community Based Early Childhood Centers. The Department of Education has extended the deadline by which Community-Based Early Childhood Centers (CBECCs) must submit an application to provide full-day Universal Prekindergarten (UPK) in September, 2014. 5 p.m. Monday, May 19th. Eligible organizations such as daycare centers, private schools, preschools and group family daycare providers with a DOHMH permit and others including libraries and museums may apply to provide UPK instruction daily, Monday through Friday, for 6 hours and 20 minutes per day, for 180 days between September 4, 2014, and June 30, 2015. The DOE will carefully screen all applicants to ensure safe, secure, high-quality options for parents. Please visit: http://schools.nyc.gov/Academics/EarlyChildhood/default to download an application and obtain information and answers to frequently asked questions. Beginning Saturday, May 17th through Sunday, June 15 —Stork will proudly support the 2014 City Harvest Feed the Kids Initiative! Every year, hundreds of New York City schools, organizations, companies, and Fire/Police Departments come together to collect non-perishable food donations for children in need. Drop off your donation at Stork, and receive 10% off any non-sale item. *(excluding Stokke and Micro Kickboard). The below items are suggested, however any donation is appreciated! When: Saturday, May 17, 2014 from 10am to 2pm. Join us as we help you jumpstart your child’s future! Resources and Services: Scholastic, Inc., Financial Planners, College and Career Advisors, and many more. Register TODAY Online OR call District 17 Main Office at 718-221-4372. Find the college that is the right fit for your child. Workshops are geared to ALL grade levels, Pre-K-12. This one day event will teach the basics of Water Safety and provide new swimmers with the opportunity to became more self-aware, confident, and most importantly safe in the water. Come out on Sunday May 18th at Far Rockaway High School and the Brooklyn Sports Club to learn about water safety and enjoy FREE classes for families and children! 300 kidnapped Nigerian school girls. This June, in an effort to spread the message that fathers matter, the New York City Fatherhood Initiative will present the Fourth Annual NYC Dads Matter Awards Nomination. These awards will recognize ten fathers from across the City who have overcome challenges to become positive and consistent forces in the lives of their children. Please consider submitting nominations of dads you believe meet the criteria described in the attached nomination form and send to nycdadsmatter@cityhall.nyc.gov by Friday, May, 16, 2014. This should be a fantastic event and acknowledges the important role that dads play in the lives of their children and communities. Support fathers as they improve their capacity to be good dads. The New York City Fatherhood Initiative continues to work with our City agencies to achieve the ambitious goals described above. The deadline is Friday, May 16th. Medgar Evers College is hosting a, ‘MEC APP Day’. This day will give students the opportunity to tour the campus, speak with faculty and staff, and to answer any questions that they may have, alongside filling out a CUNY application that will enable us to directly admit them to Medgar Evers College. In order for this day to run smoothly and successfully, the following documents listed below are required to accompany the student . Proof of Graduation: graduating seniors may provide an official high school transcript. It is requested that students confirm their attendance via email with their first and last name, phone number, and email address no later than Friday, May 23th, 2014. Should you have any questions, please contact Hamilton JB Raymond, Admissions Counselor, by email (Rhamilton@mec.cuny.edu) or by phone (718-270-6048). The annual Kingston Avenue Festival will be on Saturday, May 17th on Kingston Avenue from Bergen Street to Pacific Street. Come out for a day of FREE performances, art, games, music, food, and community resources! Mayor de Blasio’s office has put out a press release on his long awaited housing affordability plan, which you can read below. The plan itself can be found by clicking the link at the bottom. NEW YORK—Mayor Bill de Blasio today laid out a 10-year plan to build or preserve 200,000 affordable apartments across all five boroughs—enough housing to serve more than a half-million New Yorkers. The $41 billion Housing New York: A Five-Borough, Ten-Year Plan is the most expansive and ambitious affordable housing agenda of its kind in the nation’s history, and Mayor de Blasio pledged it would reach New Yorkers ranging from those with very low incomes at the bottom of the economic ladder, all the way to those in the middle class facing ever-rising rents in their neighborhoods. Unprecedented Scale: The plan calls for 200,000 affordable units over 10 years—120,000 preserved and 80,000 newly built. Affordability for a Wide Range of Incomes: Affordability programs will serve households ranging from middle- to extremely low-income (under $25,150 for a family of four). Proactive and Strategic Preservation of Existing Affordability: Agencies will use every tool at their disposal to protect tenants in both subsidized affordable housing and rent-regulated housing from the tide of deregulation, and to combat neglect and disrepair that threatens many affordable buildings. New Opportunities for Growth and Density: The City will undertake ground-up neighborhood planning to identify corridors and communities with opportunities for more housing (both affordable and market), and coordinate greater density with necessary infrastructure. Quality Jobs: Approximately 194,000 construction jobs and nearly 7,100 permanent jobs will be generated by the housing plan, and the City will work with stakeholders to make sure they are quality jobs and integrated into the City’s workforce development ecosystem. Fewer Unnecessary Barriers and Delays: The City will streamline the development process and help to contain construction costs by overhauling outdated regulations and removing duplicative agency processes. In all rezonings that substantially increase potential housing capacity, the City will require a portion of the new housing developed to be permanently affordable to low- or moderate-income households in order to ensure diverse and inclusive communities. The Department of City Planning, working with the Department of Housing Preservation and Development, will initiate and expedite the completion of a study to provide the foundation for incorporating a mandatory Inclusionary Housing Program into the Zoning Resolution. The City will allocate additional resources to its housing programs to ensure that a higher percentage of units in affordable housing reach the neediest people. As a result of this commitment, the City will provide housing opportunity to 16,000 of very low-income households over the 10 years of this plan—more than four times the number served over the previous 12 years. As part of creating and preserving more than 20,000 homes for middle-income New Yorkers, the City will launch a new mixed-income program that is 100 percent affordable. Half of all units in these projects will be set aside for middle-income households. The remaining 20 and 30 percent, respectively, will be reserved for low- and moderate-income households. Middle-income housing is essential to support our economy and workforce, which increasingly cannot afford to live in our city. The Mayor’s 2015 budget will propose to more than double the Department of Housing Preservation and Development’s annual capital budget in the 5-year plan, increasing investment to more than $2.5 billion. The City will expand its financial commitment to affordable housing using its capital dollars and tax expenditures to leverage other investment, and work with state and federal governments to expand their commitments. The City will launch two new programs to redevelop hundreds of vacant sites and build thousands of new units: the Neighborhood Construction Program and the New Infill Homeownership Opportunities Program. These programs will aggregate sites to develop affordable housing, including one- to four-family homeownership opportunities and up to 20-unit rental buildings. The programs will build capacity among smaller developers, local non-profits, and community development corporations to drive the projects. The City will work with the state as rent regulation comes up for renewal in 2015 to prevent abuses of the vacancy and luxury decontrol provisions and capital improvement rules. The City will coordinate across all agencies and use every tool at its disposal—from legal action to closer scrutiny of City contracting with bad actors—to protect tenants in rent-regulated housing from landlord harassment and neglect. The City will leverage Project-Based Section 8 vouchers to make housing affordable to those seniors whose income remains stagnant or declines over time, and will continue to push for expanding income eligibility in the SCRIE program. The City will also actively seek out ways to integrate new senior housing in its development programs in collaboration with NYCHA, leveraging their resources and prioritizing their residents. To help mitigate rising utility costs and preserve affordability, the City will launch a new program to targeting mid-size and small buildings—in concert with local utilities and existing subsidy programs—to encourage energy and water-use retrofits in exchange for affordability commitments from building owners. The program can help property owners reduce these operating costs by up to 30 percent. The City will reallocate a portion of its homeless shelter funding to finance lower-cost permanent housing for homeless individuals and families. Investment in housing that is accompanied by supportive services yields significant taxpayer savings by reducing demand for high-cost shelters, hospitals, and other emergency resources. The City will seek to renew its partnership with the state to expand the development of supportive housing and to broaden the populations it serves. NYCHA will also reinstate its policy of setting aside units for families exiting the shelter system. Read the full plan at nyc.gov/housing. Please spread the word by sharing this information along with the attached poster with the young people in your community, your neighbors, organizations you are involved with & any others who may benefit from the great opportunities being offered! Over 60 New York City agencies & organizations will be on hand to offer young people, ages 12-20, information about summer employment, internships & volunteer positions, present workshops, hold interviews for permanent employment, share information about college admissions, social & health services and much more! Below you will find a list of the workshops which will be presented, along with a list of all the participating organizations. More information is available on our website at www.cb14brooklyn.com/youth/youth-conference. If you have any questions, please contact Anya Hoyer at the CB14 District Office at 718-859-6357 or email cb14youthconference@cb.nyc.gov. 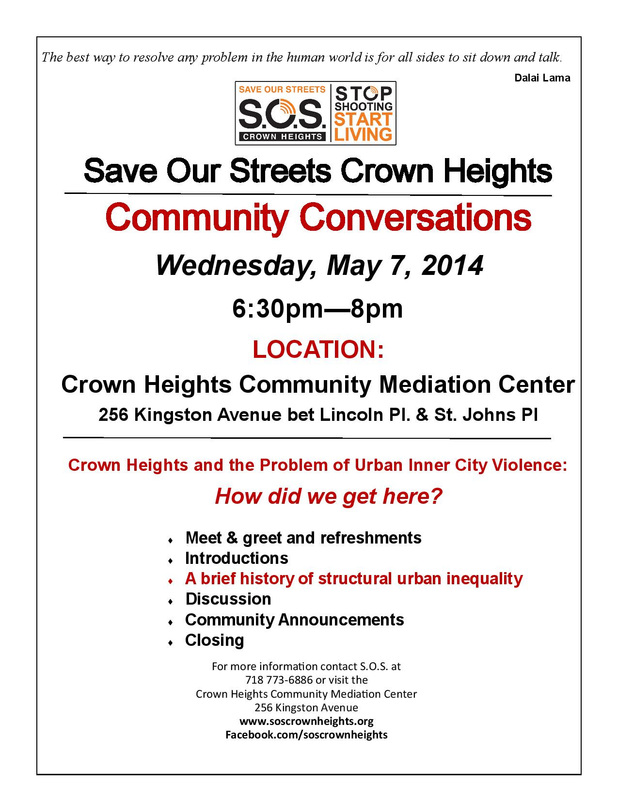 In May, Save Our Street Crown Heights monthly dialogue on neighborhood issues in Crown Heights continues with a brief history of urban structural inequality and its effects today. Come join them on Wednesday, May 7th, at 6:30 pm, at 256 Kingston Avenue for a presentation and a discussion! Refreshments will be served. 5. Ms. Kirsten Defur from the Mayor’s Office to Combat Domestic Violence will make a brief presentation detailing the services provided by the unit. The DHS Office for Civil Rights and Civil Liberties (CRCL) Community Engagement Section has shared a press release issued by the Treasury Inspector General for Taxpayer Administration (TIGTA) warning taxpayers to beware of phone calls from individuals claiming to represent the Internal Revenue Service (IRS) in an effort to defraud them. We encourage you to carefully read the press release and forward it to your contacts. The press release contains detailed information on how to tell if an IRS agent is really contacting you, and the steps to take if you receive a call you suspect is a phone scam. Check out this Fact Sheet for background info on unclaimed funds. Walter Beach (1964 NFL Champion), Viola Plummer (Dec.
One of the most remarkable tours of Fort Greene ever. Visit inside nine distinctive homes and enter some of Downtown Brooklyn’s thriving new arts organizations. A self-guided walking tour that is truly an eye-opener. Advance tickets $25 via fgahousetour.org. Day of tour tickets $30 at the Polonsky Shakespeare Center side plaza. Don’t miss it! to shred your documents containing your personal / sensitive information. This is a FREE service. You can also register your electronic devices with the NYPD’s Operation ID Program. Get exploring! Sign up for Bike the Branches—a fun, one-day bike ride where you can see Brooklyn like never before and raise critical funds for Brooklyn Public Library. On Saturday, May 17, follow one of our 12 exciting suggested routes or create your own tour; check out our online interactive maps to plan your ride. » Journey along the Brooklyn Baseball route, featuring the homes and practice fields of Brooklyn Dodgers™ and other baseball legends. » Investigate the Underworld Brooklyn tour that returns you to the scenes of Brooklyn’s most famous —and infamous—crimes. » Navigate the Waterfront tour as you take in Brooklyn’s expansive coastline. » BONUS: All Bike the Branches participants age 16+ are eligible to receive a FREE Citi Bike℠ 24-Hour Access Pass to use on May 17; Central Library will host a docking station on the day of the event. Visit as many branches as you can between 10 am and 5 pm, and get your Event Passport stamped at each location. Stop in for highlighted events, including story tellers, dance parties for all ages and bike workshops thanks to Bike New York. Then join us at Central Library from 5 to 7 pm for refreshments, prizes and fun activities at the Finish Line Celebration. Walkers and runners are also welcome! *The deadline to become a SYEP Worksite is May 16th. As of July 1st, 2014, the Senior Citizens Rent Increase Exemption (SCRIE) program will be expanded to cover seniors with incomes of up to $50,000 per year. This is critically important for older New Yorkers living on a fixed income. This is a substantial increase from the current income ceiling of $29,000. To qualify for SCRIE, you must be 62 years or older, live in a rent-regulated apartment, and have an annual household income of $50,000 or less. If you need further assistance, visit Lenox Hill Neighborhood who offer a SCRIE Assistance Project that serves seniors citywide by calling (212) 744-5022 ext. 1392. Join the NYPD for its 2014 Career Day on Saturday, May 3, 2014 at Lafayette High School, 2630 Benson Avenue, Brooklyn, N.Y. from 11:00 am-4:00 pm. Meet NYPD Recruiters from Police Department, Cadets Corps, School Safety Division, Traffic Enforcement District, and other civilian divisions. See demos from the Canine Unit, ESU, Mounted Unit, and more more NYPD units. Find out how your skills from many private sector industries such as Accounting, Financial Consulting, Nursing, Scuba Diving, and more, can be used and translated into a career with the NYPD. Bring your resume for positions not requiring an entry exam. Visit nypdrecruit.com or call 212-RECRUIT for more information. New Interactive Website for Vision Zero! Use this interactive map to share your experiences with city streets. Your knowledge will be used to create a traffic safety plan for each borough that will describe how to make each borough’s streets safer for everyone, whether walking, biking or driving. You can report issues such as red light running, double parking, poor visibility, speeding and more! Every year, approximately 4,000 New Yorkers are seriously injured and more than 250 are killed in traffic crashes. Being struck by a vehicle is the leading cause of injury-related death for children under 14, and the second leading cause for seniors. On average, vehicles seriously injure or kill a New Yorker every two hours. Vision Zero is the City’s goal for ending traffic deaths and injuries on our streets. To accomplish this, we need everyone’s participation and input. Learn more about Vision Zero. DO YOU HAVE A TAX LIEN ON YOUR HOME? DID YOU RECEIVE A LIEN SALE WARNING? Crown Heights Farm Share Info. What is the Crown Heights Farm Share? It is like a food community or food club where you get fresh vegetables at amazing prices. These are fresh, chemical free, non GMO and organic vegetables directly from Sang Lee Farm in Long Island. Every Tuesday for 23 weeks from June to November members go to Georgia’s Place (at 691 Prospect Place at Bedford Ave) to pick up enough vegetables to last you a week. In addition to paying their membership, members must volunteer 4 hours per season to help keep costs low. Can I get fruits, cheese, meats or fish also? Yes, fruits, cheese, meats and fish are available for an additional cost. YOU CAN SPLIT A MEMBERSHIP WITH FAMILY, FRIENDS OR NEIGHBORS! The purpose of this Parent Conference is to effectively empower parents as leaders and involve them in their children’s success. The next weeks are very important for the future shape of our community, perhaps the most important in years. If we all work together, we can make a difference. In 2009 New York State and Forest City Ratner broke the law when they failed to assess how our community may be negatively impacted by twenty-five years of Atlantic Yards construction instead of ten. They chose to put us at risk in order to secure expiring federal tax abatements for the arena. Together, with the Prospect Heights Neighborhood Development Council, we sued and won. Finally, as part of a court ordered process, a hearing has been scheduled for Wednesday evening, April 30th, and we can submit written statements until May 12th. Our block association is coordinating an effort to get local residents to speak at the hearing on the 30th, and also to write personal statements for the 12th. Our quality of life is directly impacted by the way the project is implemented and operated, whether built quickly or slowly. For years residents have documented violations of environmental commitments related to negative impacts like air quality and noise that the State of New York has failed to enforce. For years we have looked at chain link fences and watched our street trees cut down without a credible replacement timetable. The first demolitions related to Atlantic Yards took place nine years ago, and construction of the sixteen high rises, affordable housing and open space in the project has just barely begun. Construction may take a generation or more. Together with other local civic organizations, Dean Street Block Association has identified a few specific goals we think moving forward will most help those of us impacted by the project. First, we seek new oversight for the project by a dedicated public development corporation or subsidiary with a board that includes directors appointed in conjunction with local elected officials. We also seek improved oversight of environmental impacts, most especially those related to construction. Forest City Ratner is attempting to sell 70% of the project to the Chinese developer Greenland. Decisions will be made by a 5 member board, with 3 votes for Greenland and 2 for FCRC. We believe poor responsiveness to community concerns, and lack of accountability to the public, may only get worse. You do not have to be an expert on Atlantic Yards to come and speak. We want you to come and show you care about our community. Talking about where you live, who you are, and that you care about our quality of life will make a difference. If you can attend the hearing on the 30th and/or you are able to prepare a written statement, please contact pkrashes@earthlink.net If you need help getting to the hearing, let us know. And please encourage your friends and neighbors to come as well. The 77th precinct Community Council will be held at Center Light formerly (CNR) – 727 Classon Ave., between Prospect and Park Place – on Monday, May 12th at 7.30 pm. The Housing/ULURP Committee will meet on Thursday, May 1, 2014 at 6:30 PM at CNR-Center Light Health Care Center located at 727 Classon Avenue (between Park and Prospect Places) in the ATRIUM. The project consists of a 300 square foot rooftop addition that will not be visible from the street, as well as a 2 storey (cellar and basement) 20 foot long rear addition with a 14’ deck that projects into the yard. Windows will be replaced on the front and rear façade that are Landmark-approved. The project consists of renovations to two floors (garden and parlor) and a 2-story, 16’x16′ Brick rear-addition. The existing house is a 3-story row house, ca. 1873, with a brick-façade and italianate detailing. Only window replacement is proposed for the front façade. The rear addition has precedent in the block-interior, as there are already over a dozen rear additions. The lots for the row of houses on this side of the block are extra deep (130′). The projects consists of replacing 3 windows on the side elevation, creating a new opening in the rear façade for 2 french doors, adding an 8 foot rear deck, and relocating an existing fire escape. On April 26th, from Noon to 3 PM, be the first to explore the new Arts and Cultural Education Center of the Weeskville Heritage Center. Learn about upcoming projects and ways to get involved while enjoying the arts, workshops, refreshments, and giveaways. Come through the new entrance at 158 Buffalo Avenue (between St. Marks Avenue and Bergen Street). For more information, call 718-756-5250 or email events@weeksvillesociety.org. Mediation in the Community: What Is It and How Can It Help? What is it, and How Can it Help? Tuesday, May 13 – 6-8:00 p.m.
All members of the public are invited to attend an informational lecture on the mediation process, and how mediation may be a better alternative than formal court or administrative proceedings. The workshops will be interactive, with participants given the opportunity to directly provide input about specific locations through mapping exercises. This is the primary mechanism by which public input will be brought into the development of Vision Zero borough plans. You own a brownstone or live in a landmarked district, but what happens when you want to make a repair or change? Learn about what the New York City Landmarks Preservation Commission does, what your neighborhood association can do, the research resources Brooklyn Historical Society can provide, and your neighbors’ experiences. Panelists include Tom van den Bout, architect and former Brooklyn Heights Association President, William Neeley, Jr., Deputy Director of Preservation at NYC Landmarks, Elizabeth Call, Head of Reference and User Services at BHS, as well Prospect Heights homeowner Leslie Feder and a local building manager. This panel will give attendees practical tips on how to navigate a construction or renovation project through the Landmarks approval process. Join the Hon. Letitia “Tish” James, NYC Public Advocate, the Hon. Gale A. Brewer, Manhattan Borough President, and representatives from the Department of Consumer Affairs (DCA) for a Town Hall to help employers and employees understand their responsibilities and rights under the Paid Sick Leave Law. Enter building from the 1 Centre Street North entrance. Brooklyn Borough President Eric Adams is partnering with Delta Children on the Safe Sleep Brooklyn Campaign. Through this campaign, they will be educating parents on important safety tips for providing infants with a safe sleeping environment, and Delta Children will be distributing free cribs and play yards to families in need. Please help the CHCA (chca@crowhillcommunity.org) to identify families in need, but note that supplies are limited as only 18 families within the boundaries of CB8 will be selected by Monday, April 21st. Those chosen will receive either a crib or play yard. There are nine of each available. On Saturday, April 19th, Brower Park will host the Trinity Grace Church of Crown Heights Annual Easter Egg Hunt at 11:00 AM. It’s a free event for kids 10 and under. On April 25th, a panel discussion will be held to discuss the pros and cons of composting from 10am to noon at Brooklyn Borough Hall. Click here for more information. For those interested in signing their children up for Pre-K next fall, click on the links below to find locations of enrollment sites and more. Teen Challenge Center, located at 444 Clinton Ave (b/w Gates & Greene Ave) from 6:30pm to 8pm. Doors open at 6pm. For more information call (718)398-0750. The “Interrupters” are hosting tryouts this Saturday, April 12th at noon. 7. Hearing to remove Mr. Phu Duong and Ms. Marlene Saunders (charges against each to be read at meeting to give the cited members an opportunity to respond). Operation PROM, Brooklyn is a non-profit organization dedicated to providing free prom attire to low income, graduating, high school students. They are seeking volunteers to help sort and prepare for their 2nd annual prom dress giveaway, which takes place on Saturday, April 12 in Brooklyn. Volunteers are needed Friday, April 11 (3p—7p) and Saturday, April 12 (9a—6p). To volunteer and get more info, call Dawn at 917.306.5056. You can also send an email to Shaniqua@helpprom.org or visit operationprom.org. Investments included in the Budget will make New York safer by strengthening penalties to crack down on texting-while-driving, make New York cleaner by growing the Environmental Protection Fund, and make New York fairer by allocating funding to help raise the age at which juveniles are tried. The agreement paves the way for final passage of the 2014-2015 State Budget. Find out more about the Budget at governor.ny.gov. Working together over the last four years, we have put people above politics, building a stronger New York. With all of the arrows pointed in the right direction, we know our best days are ahead. In New York City, approximately 4,000 New Yorkers are seriously injured and more than 250 are killed each year in traffic crashes. The Vision Zero Action Plan is the City’s foundation for ending traffic deaths and injuries on our streets. Vision Zero Will Save Lives – But We Need to Hear From YOU! Come out and give us your feedback, concerns and legislative ideas on Mayor de Blasio’s Vision Zero Plan! We need your ideas to improve street safety, to identify problem locations, and to hammer out site-specific solutions that match realities on the ground. Last Tuesday’s CHCA meeting included a visit from Kicy Motley, Brooklyn Borough Director at Mayor DeBlasio’s office. Ms. Motley discussed DeBlasio’s highly publicized Universal Pre-K (UPK) program, which proposes full-day pre-school for more than 73,000 children in NYC. Think of it as the “5, 5, 5” plan: a 0.5% tax increase over 5 years on people earning over $500,000 a year would yield over $500 million in revenue to fund universal pre-K. While it’s hard to avoid news or press regarding DeBlasio’s UPK plan, many people may not be aware that the plan includes a second important component: an after-school program for 120,000 NYC middle-schoolers. Having nothing to do after school can spell all kinds of trouble for kids, especially in the “tween” years. Giving middle-schoolers a place to go between 3PM and 6PM—with interesting academic, cultural and athletic activities—will keep them busy, engaged and off the streets. Ms. Motley urges us to thank our state legislators for supporting NYC’s plan to fund UPK and expanded after-school programs. Call 866-591-9971 for the legislative hotline. Enter your zip code and you’ll be automatically connected to your legislator. Or visit www.upknyc.org for more info. School work can be hard, and while it pays off in the long run, the merchants within the Crow Hill community would like to reward five students in the neighborhood immediately, through the CHCA Scholars Program. To be eligible, students have to fill out an application, list three exams on which they received a 100% within a month of the last Crow Hill Meeting (the third Tuesday of every month excluding the summer), and drop it off at Lily & Fig (727 Franklin Avenue) with a signature from the student and a parent. Then we will draw five names at random from all the applicants the day before each Crow Hill Community Association meeting and call the winners who will then receive a reward the next day, at the monthly Crow Hill Community Association meeting. Please attach the exams (or a copy) referenced on the application as well. Applications can be downloaded from our website (below) or picked up at our monthly meetings. The Dept. of Transportation is considering traffic safety improvements on Franklin Avenue in Community Districts 8 and 9. Come out and add your input on safety and travel issues you experience while traveling, biking, walking, etc., on Franklin Avenue. On Wednesday February 12, DOT met with CB 8/9 representatives to solicit input on problems and issues with a Franklin Avenue bike lane between Atlantic Av and Empire Blvd, preliminary to a community-involved planning process. The next step will be a public forum. Attending the DOT meeting were representatives of CB 8 (District Manager Michelle George, transportation Committee Dr. Frederick Monderson, Robt. Witherwax, Holly Fuchs) and of CB 9 (District Manager Pearl Miles, Transportation Committee Ed Fanning). ACTION : DOT will put out flyers for a public forum CB8/CB9, to be held somewhere in the middle of the community (Brooklyn Museum, Central Library, etc.). The Flyers will probably come out around 3/12, the meeting might be week after 3/22. Pearl Miles will work with DOT to find an appropriate venue. 3. Carlmasis Johnson, Director of Community Outreach and Partner Engagement at NYC Civilian Complaint Review Board will make a brief presentation on police misconduct and knowing your rights during a police stop, question or frisk. Public Comments on city agency responses to Community Board 8’s Preliminary Capital and Expense Budget for Fiscal Year 2015. (Testimony will be limited to 2 minutes per person). Elections for the Crow Hill Community Association Executive Board took place on Tuesday, February 18th and all five candidates were elected. After election results became official, outgoing president (and founding member) Evangelyn Porter gave the new board her blessing along with some words of wisdom. The remainder of the old Board that were present then joined her to take a photo with the new Board. The following Saturday, February 22nd, the new Board met to choose officers. Frank Esquilin was voted in as President, Paul Carson was voted in as Vice President, Josh Thompson was voted in as Secretary, Joanna Crispe was voted in as Treasurer, and Constance Nugent was voted in as Project Manager. Please join us in wishing the new Board the best and thanking all those before us who made the Crow Hill Community Association such a strong and successful entity. UPDATE: Due to a winter storm, the January meeting was canceled. We will not hold the board election at our regularly scheduled February meeting. The board election will occur at our meeting on Tuesday, January 21 February 18. In an election, every dues-paying Member in attendance can place up to seven votes on the ballot. (Or in this case, because there are only four candidates, you can place up to four votes.) The candidates with the most votes will be elected as board members. Members may authorize another person to act as a proxy. The results will be announced by the conclusion of the meeting. To be a member eligible to vote for the board or to be a board candidate, you must pay your dues at the meeting on January 21 February 18. Dues are $30/year for a family, $125/year for merchants, $20/year for students and seniors 60 years and over. On November 15, thirteen elected officials representing residents of communities near Forest City Ratner’s Atlantic Yards project came together to demand a new agreement for affordable housing at the site as a condition approving Forest City’s proposed sale of a majority interest in the plan to a foreign developer. The representatives called for a court-ordered study of alternatives to be completed to make sure Brooklynites and the people of New York State get the best deal possible for their tax dollars. And they called for representative oversight of the project going forward to make sure this time promises are kept. Now it’s your turn. Sign this online petition to speak up with more than a dozen local elected officials in demanding Governor Cuomo not allow Forest City to take its money out of Atlantic Yards without real guarantees that the promises it made for hundreds of millions in public subsidies will be kept. Forest City Ratner promised the people of Brooklyn 2,250 affordable apartments at the Atlantic Yards project in exchange for hundreds of millions in public subsidies. Then it pushed back completing that housing for 25 years. Now Forest City wants to pull its money out of the project by selling a majority interest to a foreign developer. That’s an outrage to thousands of families in danger of displacement, and it’s a raw deal for the taxpayers of New York State. Brooklyn’s elected officials have said the State should allow the sale only if there are new guarantees for affordable housing to be delivered when originally promised and appropriate oversight to make sure they’re enforced. I agree, and call on you to direct the Empire State Development Corporation not to let the deal move forward until those conditions are met. At our meeting in November, the by-laws were accepted by the CHCA membership. They final version as accepted is below, and will live on our website under About Us > By-laws. The Garden Apprentice Program (GAP) at Brooklyn Botanic Garden is a great way for teens to learn about urban agriculture and the environment while working in one of the most exciting public gardens in the world! Apprentices can work their way up the four-tier program, potentially earning a paid position as Senior Apprentice. If you enjoy getting your hands dirty and want to work with other teens, GAP may be for you. Apprentices make a nine-month commitment to GAP, from March to November, which includes spring training, summer programming, and a weekly commitment throughout the academic year. See the tier descriptions for more information and application links. For more information, please email gap@bbg.org. Applications are due December 4. More information here. Who: Kids of all ages! March in your costume! Where: Walt Shamel Dean North Community Garden, 1096 Dean St. Photos from last year’s parade. Trash Basket Experiment at Franklin Ave. and Sterling Pl. At the request of Crow Hill, the Department of Sanitation (DSNY) is conducting an experiment at the intersection of Franklin Ave. and Sterling Pl. to help our community decide whether we want fewer public trash baskets or more baskets. This is a controversial topic: Some believe that more trash baskets bring more trash; others believe that we need more trash baskets to handle all the activity along Franklin Ave. We need your input so that together we can decide what’s best for our community. During this first phase, DSNY has removed all trash baskets from Franklin Ave. and Sterling Pl. until Oct. 25th. During Phase 2, we’ll go back to two baskets; during Phase 3, we will have four baskets. Use the simple form below to record your trash observations. During the experiment, we need everybody’s help monitoring Franklin and Sterling and the nearby blocks and intersections. Forward the form on to your neighbors, as well. Feel free to record one observation or 100, it’s best just to record every day observations—good, bad, or otherwise—whenever you happen to find yourself on Franklin, anywhere between St. Johns and Park Pl. After the experiment is over, we will share the results from our observations and DSNY’s observations. We will also survey the community before any decisions are made about increasing or decreasing the number of trash bins along Franklin Ave. Contact Judy Bartlett at bartlettjudy@gmail.com if you have any questions/concerns. Over the years, Crow Hill Community Association has been working to educate the community on the many benefits landmark status can bring to a neighborhood. We have urged interested community members to submit Requests for Evaluation on their own and over the years we have collected and submitted many requests as well. As our membership grows and our neighborhood flourishes, we have more resources to put towards achieving landmark status. Below is our proposal submitted to the Landmarks and Preservation Commission highlighting buildings of note in our district. Tired of menus and circulars blowing in our streets, stuffed in your gate or littering your hallway? Our new laminated sign will let people know not to leave them. Free to Crow Hill Association members, $1 donation to cover printing if you are not a member. Signs can be picked up at HAD Associates, 737 Franklin Ave., Mondays & Wednesdays, 11am-5pm. CHCA has been serving the community for nearly 40 years. In recent years we were instrumental in getting the bike lane on Franklin Ave. and having benches installed at numerous bus stops. We have also sponsored the “SHOP THE BLOCK” street fairs for neighborhood artisans to bring their products to market. We’ve had numerous block parties with free food, drinks, and activities for our kids. Every year we sponsor the Franklin Ave. Halloween Parade and have food, crafts, and prizes at the Dean St. Garden. This year we need your help to continue our work in the community. We need your ideas, suggestions, and support to help make our community cleaner, safer, and more enjoyable. -Clean up the tree beds along Franklin Ave.
-Have regularly scheduled crafts fairs and flea markets on Franklin Ave. Between Park Pl. and Sterling Pl. If you've recently filed a complaint with 311, email us at chca@crowhillcommunity.org with your reference # and the subject of your complaint. There's more power in numbers! Crown Heights neighborhood in Brooklyn, with boundaries from Eastern Parkway to Atlantic on Franklin Avenue, Eastern Parkway to St. Marks on Bedford Avenue, and the streets in between.